After Hypatia (a.k.a. Honeybunny, a.k.a. Mommabear) farrowed her first litter of piglets on St. Patrick’s Day, we gave her some time alone with her new family, separated from the rest of the herd. After about 5 weeks, we integrated momma and babes with the other two adult pigs, Alexander Hamilton and Eliza, which went smoothly. Alexander Hamilton seemed more interested in Hypatia’s postpartum hormones than his progeny, whom he ignored. He sniffed her a lot, and seemed confused and put out by her absolute refusal to put up with his courting behavior. Most mammals don’t go through estrus while lactating. As long as a momma mammal is nursing, she shouldn’t get pregnant. Of course, this isn’t a hard rule, because nature doesn’t have many, and you’re bound to know of at least one set of human siblings who were born a mere 10 or 11 months apart. The same holds true for pigs. It’s unlikely, but it can happen. After just a few weeks with the whole herd together, we separated momma and piglets from AH before she went into heat again. She’d lost a lot of weight from nursing, and she needed a summer of fresh food to recondition her body before being bred. She slowly gained some weight back throughout the early summer, but not as much as we hoped. She still seemed skinny around her ribs and along her back, though as the summer progressed, her belly began to round out. Her abdominals must be shot from that pregnancy, we joked. Too bad we can’t give her core strengthening exercises, said Josh, a physical therapy assistant by trade. “Impossible,” we said, “that’s just her stretched-out post-pregnancy belly, and her teats are all saggy from nursing for so long. 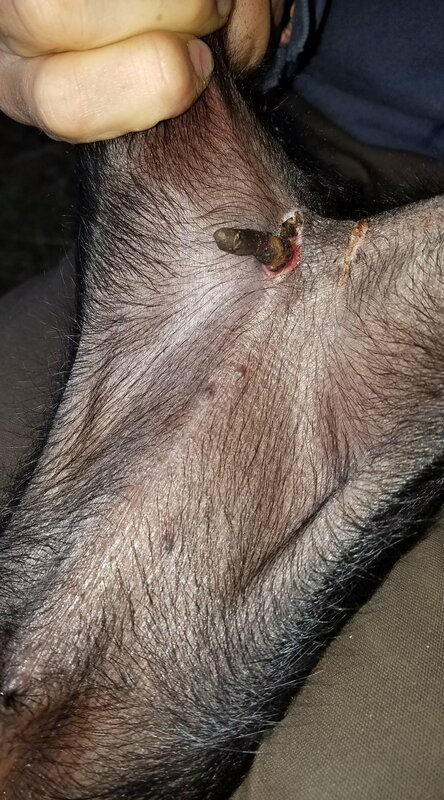 They never sprang back.” Then we explained about how we wisely separated her from the boar before she went into heat, and therefore she couldn’t be pregnant again, because she’d been nursing during the few weeks she spent with him. “Um, I think you’re having piglets,” she said. We laughed and politely dismissed this suggestion from our friend who was not a pig farmer, and therefore what did she know. Four days later, Honeybunny farrowed. I came home from work to check on her on my lunch break (because she did seem pretty pregnant looking, if we were being honest) and found her nursing six little boarlets! Since we’re old hats at this whole piglets thing, and we knew Hypatia was a good momma the first time around, we left everyone alone and let mommabear do her job. Unfortunately, 24 hours later we found the biggest most strapping piglet dead in the hut. We don’t know what happened, but most likely Hypatia accidentally stepped or laid on him and he was crushed. Down to five. Two weeks later, we castrated the piglets. We’d done this once before, and since it had gone really well with no complications, we dove into the task with the confidence of experience. Josh held the piglets, I wielded the scalpel. While it felt like I made the incisions exactly the same as last time, in two of the five operations, intestine fell out of the incision once the testicle had been removed. Horror! Panicked, I ran into the house for a needle and thread and then stitched up the incision site in hopes that the wound would heal and the intestine wouldn’t get pinched in the wound as it healed. Pigs don’t survive hernias. Ten days later, we caught all five boys to inspect their incisions and healing progress, and to our horror (again) found that one of them had some type of abdominal tissue hanging outside of the incision site (scary picture available if you want to click here). We called the vet for advice, and he laid out the cost of an operation that may or may not be successful, and we had to do the difficult work of weighing dollars against the value of an animal’s life. Ultimately, we decided to leave the piglet alone and see if it could heal on its own. It did not. Two days later that piglet died. And then there were four. That was a hard day, made harder by the fact that our wonderful boar Alexander Hamilton fell sick on the exact same day, kicking off a month-long cycle of medication and worry that is the subject of another post. At times on our homestead adventure our inexperience has resulted in funny anecdotes, and other times scary near-misses, but some mistakes we pay for dearly. I’m sorry that my action caused suffering for one piglet and death for another, and I’ll certainly be more nervous (and less confident) next time we have to castrate piglets. But, there will still be a next time. Like any toddler, these clumsy young farmers are picking ourselves up, brushing off our knees, and wobbling toward the next adventure (and possibly mistake). You are bold and courageous! May your adventures on your homestead be blessed. Thnks for sharing your story.